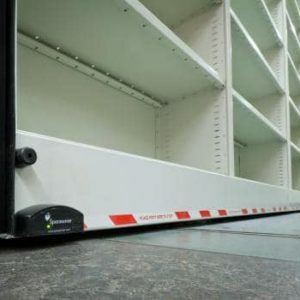 The Powered Driven Compactus makes powered high-density mobile storage more affordable than ever before. 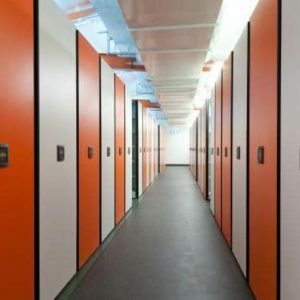 Create your own powered storage solution from a broad range of features and options for guidance, control and safety, environmental monitoring, security, lighting and more. It is safe, ease of use, productivity and reliability. The system you buy today can easily evolve into the system you’ll need tomorrow. 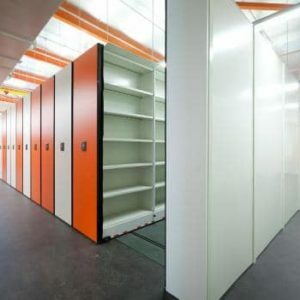 The carriages can be designed to take shelving, racking, cabinets, and (ideal for re-use of existing shelving components). Unique in-track anti-tilt safety mechanism is superior to conventional overhead mechanisms. Eliminating obtrusive overhead bars. Designed for seismic conditions. Light-immune photo sweep uses an infrared beam to detect people or objects within a closing aisle. 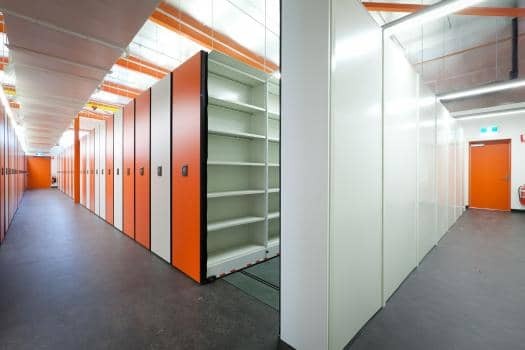 A choice of sequential or block movement ensures placement and retrieval of stored contents can be done time-efficiently through programmed unit movements. 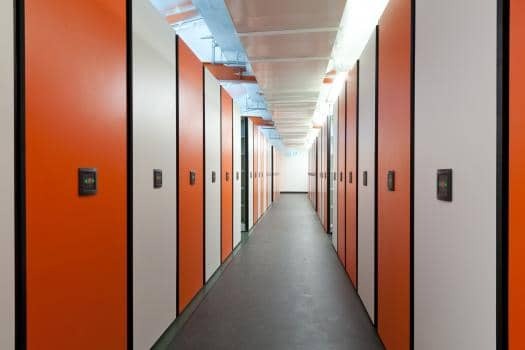 Two motor sizes are available to ensure carriage and stored content loads are correctly catered for. Programmable carriages allow tailored carriage movement speed, soft start and stop, distance between parked carriages and more. They can also be re-programmed at any time. Laminate end panels are provided as standard and can be selected from a range of colours. All control push buttons are (6cm) or more of surface areas for ease of use by disabled operators. Audible signals confirm push button commands. All electronic controls are housed behind the laminated face panels for ease of access for service and programmable changes. No need to climb above the unit or remove contents from shelves to access the controls. Built in toroid and line filters provide protection against stray radio frequencies and dirty power conditions. By adjusting track size, spacing and orientation, floor loads can be optimally distributed at practical bearing points. All tracks are fully supported and grouted to evenly distribute system weight. Carriage wheels and tracks are machine tooled for precision and tolerance to ensure maximum strength and system life. 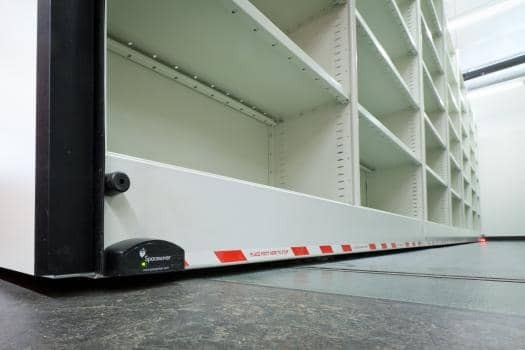 Welded-steel carriage sections enhance the Compactus alignment and reduce binding, racking and misalignment of carriage and shelving.